System 2 1/4 SLRs with aperture priority exposure, electronic shutters, TTL metering, plus interchangeable finders, focusing screens, backs and factory lenses ranging from 40mm to 1200 mm are far and few between. 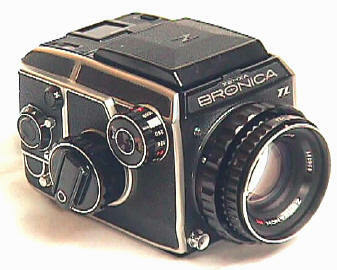 The Bronica EC-TL of 1975 made medium format history by being the world's first TTL metered 2 1/4 SLR as well the first 2 1/4 SLR with Aperture Priority Automatic exposure. 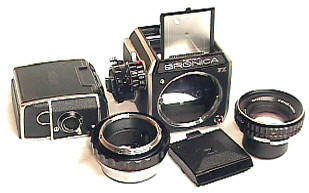 The EC-TL was the last focal plane Bronica using the classic Bronica mount -- it was replaced by the leaf shutter Bronicas. 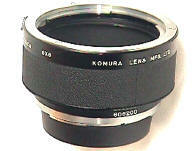 Never-the-less, focal plane Bronicas still offers amazing versatility and quality for the price. It is no wonder there are still so many very happy owners of the earlier Bronica system. Battery compartment on bottom of camera takes 6 volt Eveready 544 Silver oxide or equivalent. Like any other camera, don't story it for long periods of time with the battery installed. Though there is no battery test, its equivalent is setting the camera on D for double exposure, depressing the depth of field button, and seeing if the finder LED's light up. 25 years later, the EC-TL's weak point is replacement parts for its electronic shutter. The chrome button on the left is the shutter release with threaded cable release. The Red button on the right is the depth of field preview, which activates the meter. Shutter speed range from 4 seconds to 1/1000th plus B. NO battery drain on B or the manual speed of 1/40th, indicated by the Red Dot between the A and B settings. Flash sync speed 1/60th. Meter EV range 4 to 19 at ASA 100. ASA set by rotating dial in the center of shutter speed dial. The Red A stands for AUTO, which for the EC-TL means aperture priority exposure. The selected shutter speed is shown at the top edge of the finder. On Auto, shutter speeds are set steplessly. On manual, you can select the half stops between the marked shutter speeds. Mirror lock up possible by pressing in the chrome button below the accessory shoe, and then pushing down nearby plastic lever. 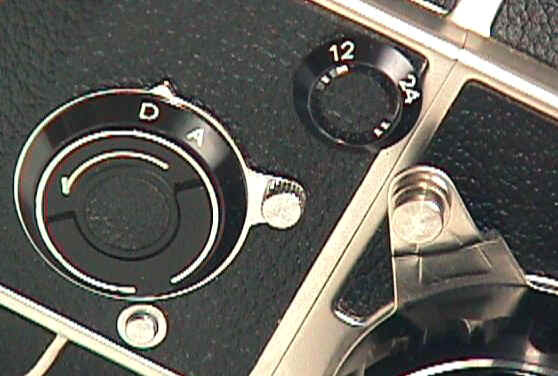 The shutter cannot be released unless there is film in the camera, or unless you have set the multiple exposure lever to "D" for double -- this enables you to test the shutter or flash sync. You can make as many double exposures as you like. 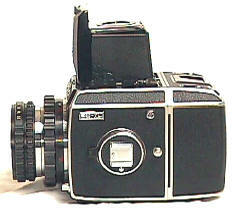 To set the back for 120 or 220 film, simply set the selector dial for 12 or 24. 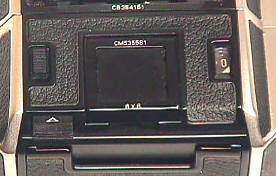 The small button on the upper left is the focusing ring release button. Note the two piece mirror. The bottom piece goes down instead of up. 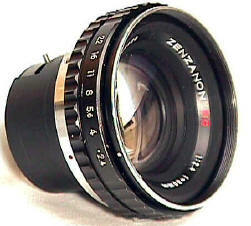 Shown is the hard to find and very desirable 80/2.4 Multicoated Zenzanon. Personally I always preferred the 80mm focal length to the 75mm as a 2 1/4 normal. 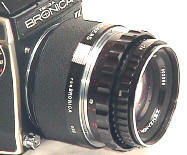 I never understood why Bronica choose the too short 75 as their normal lens -- and still don't. Pushing the upper latch down and the lower latch up springs open the back. 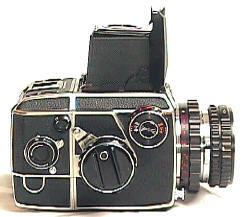 Notice the film reminder slot and the large easy to see film counter. That large slot on the rear of the back is for dark slide storage -- they thought of everything. Back quickly and easily removes just by inserting the dark slide. Pushing the two knurled knobs together removes the insert from the film back. On the left, the very useful Komura 2x Teleconverter. 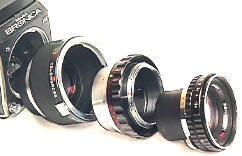 Middle pic shows the separate components of Teleconverter, focusing ring, and 80 mm lens. Pic on the right shows all three components assembled on camera. 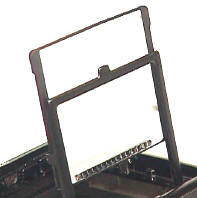 Focusing screens flip upward inside metal guides for easy removal. Note the shutter speeds on the screen edges, which are not on five EC screens. 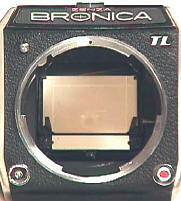 The shutter speeds on the focusing screen are how to tell the difference between the EC and EC-TL screens. Omega and Alpha: The EC-TL and the Zenza Deluxe. In use the EC-TL handles very easily and comfortably. It's one of my favorite 2 2/4 SLRs. 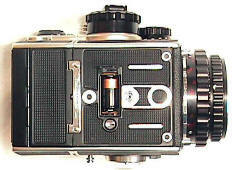 I find its handling better in fact, than all but the recent Hasselblad.